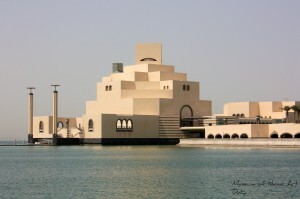 Within walking distance to the souq, next to the Corniche Promenade, the Museum of Islamic Art is well worth visiting. Every Thursday and Saturday starting 2p.m., you may join their highlight guided tour for free if you are in a hurry. The tour takes 40 minutes. The museum features glass, metalwork, fabric, ceramics and manuscripts from ancient to modern times. You also have a choice of quick bite in the museum cafe or fine dining at the IDAM Restaurant with their alcohol-free menu designed by the Michelin 3-star chef Alain Ducasse. Please check the MIA official site for latest events and Ramadan arrangements. The Corniche Promenade or Doha Corniche is a 7km long boulevard lined with palms and greens together with modern architecture along the sea front. Al Corniche Street, parallel to the Doha Corniche, join the Hamad International Airport to the West Bay new business district. This promenade is loved by joggers and anyone who enjoy a pleasant walk along the sea. 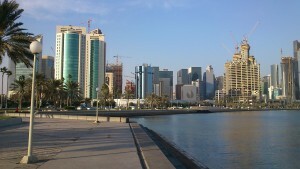 Monuments like The Pearl, landmarks like Qatar National Theatre and Museum of Islamic Art, modern skyscrapers, parks and playground can be all found along here. Don’t forget to take an evening boat trip to enjoy the wonderful skyline of Doha. Gold Souq, a souk that is full of gold, pearl and jewellery. Completed in 2012, the new Gold Souq follows the traditional Qatari architectural design, the two-storey building provides premises to over 40 jewellers. A must-see no matter if you love golden jewellery or not. Located next to the Katara Beach, Katara is a unique cultural place rich with many arts displays events. It functions as a city hall which hosts different cultural events and art festivals, both free and paid. Completed in 2008, the beautiful Katara Amphitheater is a must-see. 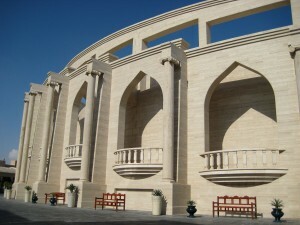 It combines both classic Greek theatre idea and Islamic features under the blue sky of Qatar. The Katara beach and cafes are also great choices for relaxing too. The Fariq Al Salatah Palace, formerly Museum of Heritage, is now surrounded by a new and modern structure to form the current Qatar National Museum. Award winning architecture Jean Nouvel was hired to design a brand new face for it. Travellers s who arrive from the airport may be puzzled by this big ring of interlocking discs pavilions occupying over 1 million square foot of space, not knowing that it houses both the history and modern life of Qatar. Those who are interested in the traditional dhows (vessels with one or more masts and lateen sails that used in Arabian region) should not miss this museum too. The museum is undergoing construction and schedule to open in early 2016. Souq Waqif literally means “standing market”. It’s a market so shopping is the main activity here. If you are not from the Gulf region then everything here is enough to enchant you. Explore different alleys to find more shops and stores that sell traditional goods, from daily necessities like spices to fabric, fashion, handicrafts and Shisha pipes. 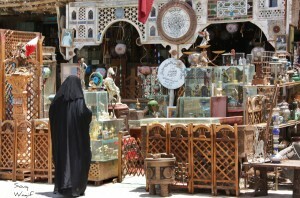 The souq is not very big, though if you think “I will come back later to get it.”, you may not be able to find it again. The Souq Waqif Art Centre was opened in 2008. It started off with some small artistic shops and workshops offering art class. But it was closed 2 years later when the rental contract was not renewed. In 2012, it was re-opened. 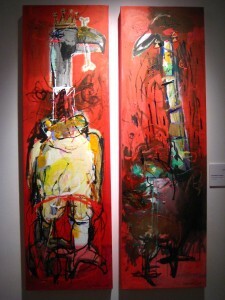 And it does not only showcase local artists’ work but also holds exhibitions for global artists. The Art Centre now aims to preserve and inspire both local and Middle Eastern artists, and share ideas and knowledge among anyone who loves art and culture. This oldest art gallery in Doha exhibits modern artworks from both local artists and the Gulf region. And it’s not far from the Souq Waqif Art Centre. Souq Waqif Spring Festival has become a recurring event each year. The 15-day festival scatters all over the Douq. There are shows at Al Rayyan Theatre, games and activities at the Games Village at Al Almed Square, circus, clowns and street performers at the souq alley and art workshops at the Souq Waqif Art Centre. Don’t forget the dolphin shows too. The festival is for everyone! Situated next to the Camel Souq and Souq Waqf, the Doha Fort has undergone multiple conversions throughout its lifetime. It was first build as a military barracks in 1880 under Ottoman occupation. It was then convert into a police station, a prison in 1906, a fort in 1927 and finally a museum in 1978. The museum now houses both traditional Qatari crafts like gold works, wood works, history and Bedouin handicrafts together with military arms that were once used in the fort. Souq Waqif is certainly the most attractive and vibrant souq in Doha, not to mention its historical status. It’s not just a tourist attraction but locals come to look for traditional Qatari goods as well. (See “What can you buy in Souq Waqif“) However, there are souqs that specialize in different merchandise which also make them one of a kind. Here are some other souqs. The Falcon Souq is yet another amazing experience that you shouldn’t miss. Falconry is one of the favourite hobbies of Qatari men. It can get rather obsessive. In Falcon Souq, you can buy anything from the falcons to all rearing and training equipment. The Gold Souq is very close to Souq Waqif. A few of the shops still sell bullion though most other shops focus on gold and silver jewellry with or without precious stones. All golden jewellery sold has a government stamp to prove its purity. It’s well worth a visit even you don’t intent to buy. The shopkeepers are not pushy. Opening hours: Saturday~Thursday 9a.m.- noon, 4p.m.- 8p.m. Friday 4p.m. – 8p.m. Â Located behind the Salwa Central Market, Omani Souq is small yet comprehensive. It sells a big range of goods – from spices, nuts and dried fish, to perfume and incense burners. Camel sticks and other household items can be found here too. After the big success of the original Souq Waqif in Al Jasra, the government has decided to replicate it and build another one in Al Wakrah. It was designed to be a mix of the original Souq Waqif and Katara Cultural Village. Souq Waqif, Doha, Qatar – Never cease to amaze you.